This is a transcript of SYS Podcast Episode 169: Writer / Director / Producer Bryan Bertino Talks About The New Horror Film, The Blackcoat’s Daughter. Ashley: Welcome to episode #169 of the “Selling Your Screenplay Podcast.” I’m Ashley Scott Meyers Screenwriter and Blogger over at – www.sellingyourscreenplay.com. Today, I’m interviewing writer and producer, Bryan Bertino. Bryan wrote and directed the horror film, “Strangers” as well as several others. He recently set-up a production company to produce horror films. And they just produced their first film, “The Blackcoat’s Daughter.” So, we dig into his career as a Writer/Director, as well as his new career, running a production company and producing films. So, stay tuned for that. If you find this episode valuable, please help me out by giving me a review in iTunes. Or leaving a comment on YouTube, or retweeting the Podcast on Twitter. Or liking us on Facebook. These social media shares really do help spread word about the Podcast and are very much appreciated. And websites or links that I mention in the Podcast can be found on my blog in the show notes. I also publish a transcript with each episode. In case you would rather read the show or look up something else up later-on. Just go to – www.sellingyourscreenplay.com/podcast, and look for episode #169. 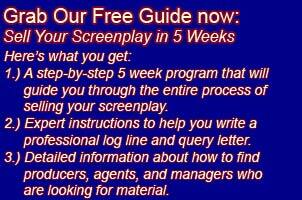 If you would like my free guide, “How to Sell Your Screenplay in 5 Weeks?” You can pick that up by going to – www.sellingyourscreenplay.com/guide. It’s completely free, you just put in your Email address and I’ll send you a new lesson, once a week for 5 weeks. Along with a bunch of free bonus lessons. I teach the whole process of how to sell your screenplay in that guide. How to write a professional log-line and quarry letter. How to find agents, managers and producers who are looking for new material. It really is everything you need to know to sell your screenplay. Just go to – www.sellingyourscreenplay.com/guide. So, now a quick few words about what I am working on this week? Once again, the main thing I’m working on is? Post-Production for my crime, action, thriller, feature film, “The Pinch.” We have “Locked Picture” finally! Though, basically the edit is done, and that’s great. Slowly, but surely, it’s moving forward. So, now I’m in the process of trying to get all the various technical folks on board. Get them what they need. All the different technical people they need, you know, different copies of the film, different sound files. You know, the special effects guy is going to need a couple of different clips. You know, the high res. Clips he can work on. So, I’ve got my colorist going to work this week, doing the color correction, color grading. We’re talking about doing some cool filters to give the film an interesting aesthetic. So, that will be all through the colorist. I’ve got my dialog editor, lined up as well, I talked to him last week. He’s going to do the dialog editing. Which basically means clearing up all the dialog. Make sure the dialog is easy to understand, and clear and easy to hear. And he’s also going to do the remixing at the end. Which basically means he’s going to take the sound design and the dialog, you know, all the effects, the music, and the effects from the composer. All that stuff, and he’s going to mix them all together so that, they are all leveled off, and sound proper, and work together. And I still got to bring in my special effects guy, as well so. I got to go through the film. Hopefully this week. And really just go through each shot and figure out exactly which special effects I’m going to need. And that’s going to be a matter of packaging that stuff up on a drive. And my special effects guy, actually lives in Florida. So, I’ve actually got to Email, or actually physically send him a hard drive of stuff. But the first thing I’ve got to do with that again is, review the film probably a couple of times. Go through each shot and figure out what special effects I need. There’s some blood spatter, some gun, you know, muzzle flashes, gun splatter. There’s a couple of places where I want to remove a logo. There’s a Apple phone, with an Apple logo, kinda want to remove that. There’s a couple of special effects type of CGI, types of things I’m going to need. And that’s all, like I said, we got to get all that basically. I’ve got to figure out what I need. And I’ve got to get it all packaged up. So that he can begin working on that. So, again, slowly but surely this thing is moving forward. I feel like a, you know, another 2 months, or so, and I’ll kinda be on that home stretch. These guys, all the technical guys, they’re going to need a couple of months to do what they need to do. A lot of these guys have other projects, they are working on. Obviously I’m not paying very much money for any of this stuff. This just, is a micro-budget film. So, you know, these guys have to work when I have to work around their schedule, and that’s totally fine, if it takes a little longer, that’s fine. I just want the quality to be there. And obviously I don’t have a lot of money. So, I just got to compromise on time, if it takes a little longer than I might want. But, everyone seems really good on it. And excited to be working on it. So, I’m excited to kinda get into this next stage. “The Pinch.” Again, it’s a horror thriller script. My idea is to potentially shoot this after I get, “The Pinch” done. So, as I said, it’ll be nice to simultaneously finish up “The Pinch” around the time that this script is all polished up. I’m pitching this script screen, but as a tech. start-up company, again, kind of a low budget horror thriller, similar to “Scream” but, you know, the people are a little older. Since they are working at a start-up. And as I said, the, hopefully the timing will all come together. Frankly at this point, I will probably finish this script quite a bit ahead of finishing, “The Pinch.” But, that’s fine, just get the script done, and then polish it up, and maybe I even start doing a little pre-production if I decide I’m definitely going to produce it. So, that’s what I’m working on. So, now let’s get into the main segment. Today I’m interviewing Writer/Director/Producer, Bryan Bertino. Here is the interview. Ashley: Welcome Bryan to, the “Selling Your Screenplay Podcast.” I really appreciate you coming on the show and talking with me today. Bryan: Yeah, thanks for having me. Ashley: So, to start out, maybe you can tell us a little bit about your background. Where did you grow up, and how did you get interested in the entertainment industry? Bryan: And quit my pizza delivery job, and drove out here, with $1500.00 kinda under the idea. I’d figure out an idea to be in the movie business. Ashley: A-huh. So, let’s talk about? Ashley: Yeah. Let’s talk about that, for a minute. Because I get a lot of Emails from people. You know, that are moving to L.A. So, maybe you could talk about that experience some? You know, even just generally, where did you actually end up landing, in terms of an apartment? And how did you get that first job into the business. Bryan: I got out here, I, you know, my girlfriend had at the time had moved out six months earlier. And she was working at a production company, she was the receptionist. And so, you know, I was suddenly in Silver Lake. I had never been in a city as big as L.A. I had never, I always tell people, if you’re coming from middle, middle of the country, or whatever. That they, L.A. is an adult portionate. You know, L.A., New York, these are the two places that kind of, you really have to go there knowing you’re going to be lonely at times, you’re going to be overwhelmed at times. And I was certainly that way. I mean, I came out here. I tried, I worked on little tiny low-budget $200,000.00 independent movies, as a grip, an electric, I you know, I talked my way, into an assisting editor job at a production company. When I really didn’t know add-in. You know, I was a runner, just driving, tapes all across the city. You know, anything that I could do, to get some, to pay my bills. And, what I think all ends up happening? When you come out to L.A. is that you’re coming from film school. Or you come from the environment of which you were at, where you were actually making things. You were actually like, telling stories, and addressing your thesis clearly. Or maybe you and your friends, you come out to L.A. and you’re suddenly getting coffee. Or you’re carrying the cable, or you’re something this far away from what brought you to movies in the first place. Which is, telling stories, or creating. And so, really I ended up coming into writing. As a way to make movies in my head. It was a way for me, while I was working all these different jobs and not being asked my opinion on anything, to kind of go home at night. And imagine you know, the movie that I would make. And that’s kinda what led me into typing out my first script. “Ha, ha, ha, friend.” Funny, and people really responded to it. People really loved what kind of characters I was writing. So, then I wrote a second script, and it was garbage, it was horrible. It was like 150 page, and there was no structure, no, you know, I kind of accidentally stumbled into structure on my first script. On my second one, it was all over the place. And so, as I approached the third script, I kinda went back to that original screenplay, and said, you know, what did I do right? What did I do wrong? And it was only kinda then did I start to realize structure. So, then I was like, how much structure would matter? In, you know, in telling stories. And then you know, I started going back and watching all the movies that I grew-up loving, and kinda pausing. Thinking about where are things here at certain 30 minutes? Where are they at the mid-point where are they? And so, then when I set-off to write strangers. I had a much better sense of how to be a screenwriter. And so, then I wrote the script. And again, was really happy about it. But, I had no, you know, I had no meanings to get it into the hands of, you know, I wrote quarry letters, and you know, a friend of a friend of a friend is an assistant at CAA, here, you know, one of the different agencies. So, sometimes I would see people. I wasn’t really, I had no connection, I’d been staying with family and friends. So, what I ended up doing was. I would save up money, as I was working on those jobs. And then enter a screenwriting competition. Because I felt like that was a possibility. There were specific ones, at the time, and then maybe more left now. But, the one I had really focused on was the Nickel’s fellowship. Was, alright, this scene like a real possibility because I knew this screenplay. If you finished high enough, you got on a list that went to agencies and managers. So, I was very fortunate, “Strangers” finished in like the top 400 of the 8000 submissions. And literally was read by a manager. And I sold the script 2 weeks later to Universal, and it changed my life. Like I am one of those stories. Where I did not have a bank account when they sold my script. So, I didn’t know what to do with the check. Ashley: Now, let’s talk about the, that’s a great story. I mean, yeah, The Nickel’s is definitely well regarded in the industry, I definitely recommend people check that out. Let’s talk a little bit about the getting on as a director. I get a lot of Emails from writers saying, how can I attach myself as a director? And I’m always very hesitant to advise that. Because I think it can really ultimately sink your chances. Bryan: I mean, I had not directed anything. And honestly, like I 100% agree with you. That when I sold that script. The last thing that I wanted to do, was place an attachment of a first time film maker, with no amazing short films onto it, you know. I did not want to instantly make it impossible to sell the script. And often if you, you know, my biggest advice to somebody that want to direct, is to write. But, be, I think it’s about getting your foot in the door. I mean I, when I’ve had, when I sold the script, I had not attached to direct. And I in fact, when I sold the script, I was fired by Universal. Six weeks after, you know, because they wanted it to change the script into a completely different direction. And so, I did a re-write, they didn’t like it. They went in a different direction. And brought another writer in. It was only 2 years later, or about, almost 2 years later, that they started, they went back to the spec. And were like, we messed this script up, by having all these different writers, and different takes, and it’s like, now it doesn’t resemble the thing that we liked in the first place. Let’s go back to the spec. And in that process of going back to the spec. They brought me in to have a conversation about it. And suddenly, I walked out and an hour later, my call telling me the studio wanted me to direct the film. Which is a story that never happens. But, the part that I wanted to focus on, for you? Is, the work that I did, after in selling that script, continuing to write, taking re-write jobs. Like working in the industry, you know, I worked for you know, I got a re-write job for Jerry Bruckheimer films. I wrote a blind script for Scott Reardon, productions like. So, I was working for 2 of the biggest producers in Hollywood, and getting notes, and learning. And so, when that’s, all of that helped me, to two years later. When I went into a meeting I was at, I was able to talk about them, and talk about the movie, and talk about the script. And in a more refined way. You know, I would almost advise people that are actually writing, you know, just get in the game, get your foot in the door as the writer. Because you know, that’s hard enough to be in the big leagues, you know, it is such a massive adjustment period. That you know, if you continue to do good work. You know, directing can, will come around. And you know, that door can open later on. It doesn’t, you don’t have to have all your dreams come true, of the first 5 minutes of walking in the door, and landing in L.A.
Ashley: Yeah, yeah. So, sound advice. So, let’s dig into “The Blackcoat’s Daughter.” Which is a film you produced. Maybe to start out, you can just give us a quick pitch or a log-line for that film? Bryan: Yeah, “Blackcoat’s Daughter” is, it’s a movie about, it’s funny you say that. It’s a hard movie to boil down into one line at really alleviate about loss and connection, and. But, you know, it’s set in a boarding school. And over one kind of winter break. Where someone is kind of faced with the darkness. And you know, an occasion has to be made up. And do you go towards the dark, or not. And what of the ramifications of that. Ashley: How did you get involved in this project? Bryan: A few years ago. I kinda decided I wanted to start producing. You know, I feel very strongly about horror and the directions that I believe in. It can be so much more than what you often end up seeing when you’re not kinda traditional Hollywood films. And I found in my own experiences that it’s very difficult to find like-minded producers, or executives that were willing to kind of think, you know, you can have drama, and horror mixed together. And you know, talking to different writers around town that love the genre. But, feel like, the same way I did. That they didn’t really have a home for it. And didn’t have people that were there to help the process, so I decided, you know, I worked within an executive a few times that I enjoyed, named Adain and Bill. We started this company under the saying, hey, we can be that producer that can, you got. You would have a home to have someone kinda encourage the, those kinds of stories. You know, from people that I actually love the genre. So, we you know, sat down and started working with different writers. And kind of let everybody know that they can be comfortable. That we weren’t here to take your idea and change it into something, some sort of mold. We were instead going to do whatever we could to encourage or improve upon the idea that you wanted to tell them. So, you know, with Oz, we read the script, and honestly like the way, you know, as like, I love when I can pick-up a screenplay, and not that it’s a book. But, at the same time, you know, especially with the core, like if I can read a script that’s in the genre. That there is a tone that I can feel and I can see the move and me. And it’s not just, you know, bland, you know, one-line “Boo.” And instead is actually creating an atmosphere, it always excites me. You know, if you look at Oz’s writing? You know, it was very creative from 5 pages in that he had a voice. And so, you know, as I, when I finished the first draft, I had a feeling that when I. It amazes me, now, that the work, I was involved in the project for 4 years. When I saw the first cut of the movie, it felt like that script. I felt the same the search wasn’t all the same in different moments. But, like, that voice, that tone, had resonated for you, four years later. You know, because Oz had a vision for this movie from the get go. Ashley: Yeah. Now, just walk us through your process of getting scripts? How do other scripts come into you, your company? I know that there’s going to be a lot of writers thinking, this sounds fantastic, how do I get my script into your hands? Do you typically take things through agents, or do you take personal recommendations, what’s the submission process like? Bryan: Yeah. I mean, there’s some of like personal recommendations, some of it. you know, through agency, I mean, you know, we’re a small company, so you know, we’re very hands off. So, you know, we’re only going to probably develop, you know, so many production companies. That are developing plenty of projects that are 15-20 projects at a time. You know, we’re developing 3-4 a year. So, we, you know, and so, you know, the process for us, often is, I mean, Hollywood is an animal and what that animal eats is scripts. So, you know, a good script I of course want to get my hands on. But, yeah, it’s something where we have to be very collective. Because we know that we, as we said before, I work on with Oz, for 4 years. It’s a long, we’re going to be there for the long haul. And so, we have to be very careful about what we’re working on. Bryan: So that, we can be there towards them when they need us. Ashley: Yeah. So, as an example, how did you get this script? Was Oz, somebody that you knew? Like, just you’ve known for a few years and read the script? Or what? Bryan: No, it’s, it did come. Yeah. We had been, I think Oz’s manager Tom had reached out to us. And I think that you know, he had, gotten his script out to a few people. And I think it had helped him get a manager, and that manager reached out to us. And a guy I worked with our company read it, and you know, he was reading. He’s read kinda those scripts, and he knew that it was something that I would connect to. And that Adrian would connect to. And then kinda felt it up to me. Ashley: How could people see, “The Blackcoat’s daughter?” Or do you know what the release schedule is going to be like? Bryan: Yeah, it’s going to be like, Tuesday, this next week, I don’t know when this will air? But, kinda that. Ashley: So, you’re saying, the 28th. Bryan: Yeah, on the 28th. It’ll be releasing, it’ll be able to see it on iTunes, Amazon, all the digital platforms. And it’s a limited theatrical release, you know, on that Friday. But, I think it’s fairly limited. I mean, really, it you know, Amazon, iTunes. Bryan: And right now, it’ll fill DirectTV. So, yeah, those are all the different places you can check that out. It’s a really great movie. And I hope everybody enjoys it. it feels like we have the 70’s, that I think that a lot of people are feelin’. Ashley: Thanks Bryan, I really appreciate you coming on the show and talking with me today. Good luck with this movie. And all your movies in the future. Ashley: Thank you, talk to ya later. You too, bye. Ashley: A quick plug for the SYS Screenwriting Analysis Service. It’s a really economical way to get a high quality professional evaluation on your screenplay. When you buy a 3-Pack, you get evaluations for just $67.00 per script for feature films, and just $55.00 for tele-plays. All the readers have professional experience reading for: Studios, production companies, contests, and agencies. You can read a short bio on each reader on our website. And you can pick the reader you think best fits your script. Turn-around-time is usually just a few days but rarely more than a week. The readers will evaluate your script on six key factors. Over All Craft – Which includes – Formatting, spelling, and Grammar. Every script will receive a grade of – Pass, Consider, or Recommend, which should help you roughly understand where you script might rank if you were to submit it to a production company or agency. We can provide an analysis on feature films or television scripts. We also do proof reading without any analysis. We will also look at a treatment or outline and give you the same analysis on it, or give you the same analysis that I just talked about on the treatment or synapsis. So, if you are looking to vet some of your projects. This is a great way to do it. We will also write a log-line and synapsis for you. You can add this service to the analysis or you can simply purchase service as a stand-alone product. As a bonus, if your script gets a Recommend, from one of our readers? You get a free Email and Fax Blast to my list of industry contacts. This is the exact same Blast Service I use myself to promote my own scripts. And it is the same service I sell on the website. It’s a great way to get your script into the hands of producers who are looking for new material. So, if you want a professional evaluation of your screenplay at a very reasonable price, check out- www.sellingyourscreenplay.com/consultants, that’s www.sellingyourscreenplay.com/consultants. On the next episode of the Podcast, I’m going to be interviewing Writer/Director, Matt Hamley. Matt recently wrote and directed a short film, which I thought was excellent. So, I invited him onto the Podcast to really help us understand the nuts and bolts of producing a no budget short film. He literally shot this short film on an iPad, and then he used a whole bunch of different Apps. That he downloaded to the iPad to get it through post-production. And we talk about exactly what apps and tools he used to create the film. And again, I think it’s literally, I think he spent less than $200.00 producing this thing. And it’s really kind of a cool film. I will link to that in the show notes next week. And again, he comes on and really dig into just everything he did, nuts and bolts of what he did, and really explain in great detail, exactly how he did this short for, again, I think less than $200.00. So, If you’re listening to this Podcast, you’ve been listening to this Podcast for a while. And are thinking about writing and producing a short film. This is really going to be a great, great episode for you to really dig into those nuts and bolts. Most of us have, most of the people I would think, that listen to this Podcast. They probably have a video camera on their phone, or their iPad. So, this is just really very much well, within the scope of what just about anybody who is listening to this Podcast could actually accomplish. So, keep an eye out for that episode next week. off-the-ground. So, just again, really keep that in mind, you’re just sitting in your room, writing day after, day. You don’t feel like your career is moving ahead as fast as you might like. It might be time to get out of your comfort zone and try something new. Just, you know, nothing, just being in your room. Again, I totally understand that. Because I consider myself very introverted. And I really got into it, writing just to be a screenwriter. I wanted to sit in my room and write. I don’t necessarily want to deal with a ton of people, you know, be a manager, producer, these kinds of things are not the things that come very naturally to me. But again, I just think getting out of your comfort zone and trying to make things happen, try new things. I think it’s really just the greatest way about actually moving your career forward. Anyway, that’s the show, thank you for listening.